Our hypothesis was that the lot we chose had good mojo. Hypothesis confirmed: Everyone who enters the house is filled with good feelings. Standing in the great room, I take in the sight of our pool and can’t believe I’m not at a resort in the Caribbean. I turn and catch a glimpse of my home office—a funky white, pink and orange oasis of a different sort—and feel like laughing. 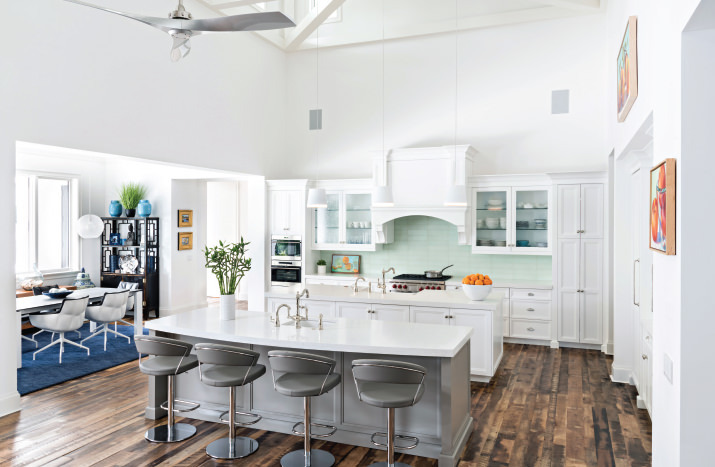 I look up and see the most glorious white beamed and vaulted ceilings, with clerestory windows that flood my kitchen, dining room and living room with a sun-dappled glow. It’s a cheerful, relaxed house with good mojo to spare. 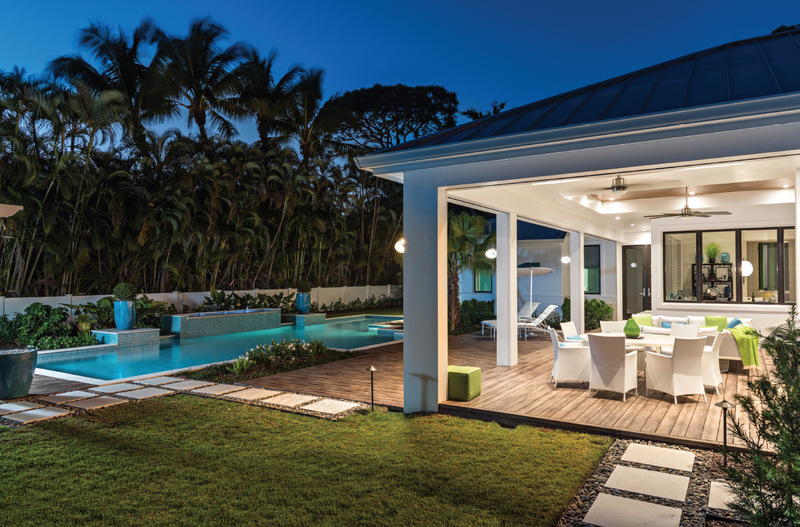 Many of the details of our home emerged in a brainstorming session with award-winning Naples architect Jon Kukk. Before I met Jon, I didn’t know words like “clerestory” (a high window that lets in air and light). Now, I’m versed in a whole new vocabulary. At our housewarming party in November, Jon eyed our Cape Cod paintings, our Shagtastic rugs, our spaceship-like B&B Italia dining chairs, our son’s Legos—in essence, our riot of possessions. At the housewarming party, we took a photograph of our lot’s previous owners in front of our black “Titanium Leather” granite fireplace. When I selected it, I didn’t realize that Titanium Leather comes with some speckling. “Did someone splash solvent on our granite?” I asked John from Marbleworks. “Nope. Those dots are the result of denser rock interlaced throughout,” he explained. Luckily, the granite injects just the right amount of darkness to balance the bright white of the great room, and the dots fit with our circle theme. 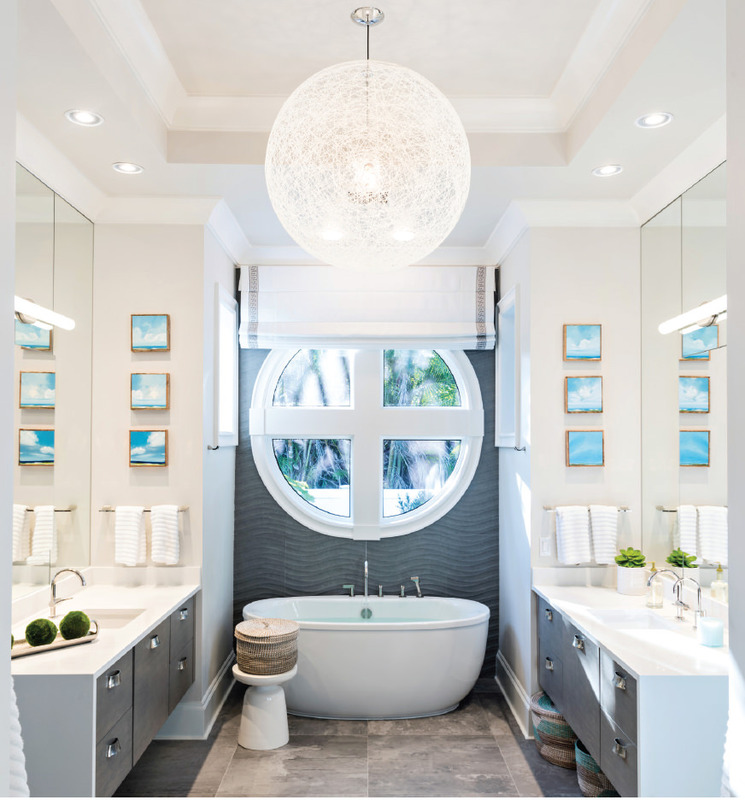 We have circles galore, from the outdoor sconces from Wilson Lighting, to the groovy Palestra dining room pendant lights, to the round, bisected window idea I stole from a house in Old Naples. I asked Kukk Architecture if it would be possible to put that window on steroids (quadrupling the size of the original) and make us two of them. When you truly love something, go big or go home—or in this case, go big and go home. I am the picture of homeowner contentment, but in case anyone thinks I just blinked and this house suddenly materialized, let me just say: If only. For anyone crazy enough to build a house from the ground up, it should come as no surprise that the road from sandy lot to finished product had its share of twists, hazards and outright roadblocks. I outlined some of the early challenges in “Diary of a New Home Build” in the April 2016 issue of Gulfshore Life. That article was a veritable valentine to our builder, Harwick Homes. Now that we’re past the “finish” work (painting, floors, cabinetry, lighting, etc.) and in the home, am I still feeling the love? Absolutely. After many months of meetings, it might be less “fiery honeymoon” passion now and more “seasoned marriage,” but our love will endure for one simple reason: Harwick came in on-time and on-budget. In the realm of construction, that makes them a mythical creature. I’ve been acquiring knowledge every step of the way, and I’m eager to share what I’ve learned. Here are some details from the process, from the small/amusing to the nearly heart attack-inducing. The Change Order Summary tells much of the whole story. At the start of our journey, I speculated to Harwick Homes President Mark Smith that I wouldn’t trouble him with more than a handful of changes once we set a plan in motion. I’m surprised he didn’t let out a giant guffaw. Our final change order number? Forty-three. Everyone at Harwick remained good-natured about these changes. Perhaps this is because others have run up hundreds of change orders because of crippling indecision. It could also be that they added an additional $85,930.63 to the cost of house. In other words, Harwick stayed on-budget but we didn’t. As we got deeper into the project and better-educated about our choices, we revised and inflated our own allowances. For example, my husband, Tom, wanted the upstairs workout room floor reinforced (Change Order No. 14: $4,191.98). Tom has been known to shake the rafters when he does P90X, and $4,191.98 seemed like a small price to pay to keep him from falling through the floor into the garage below. I probably added the other 42 items—for the good of the collective, of course. Unfortunately, we never revised the original dimensions of the pergola, and we wanted more shade the second it went up. I called Harwick Homes Project Manager Kathy Katasak to find out how much it would cost to extend it. A day later, she had the estimate. “Do you want to guess?” Kathy asked me. “Please tell Tom that I used some restraint and declined.” I apologized for making her chase down the number for naught, but she was cheerful as ever. She’s good people. P. S. We made some snazzy blue and green Sunbrella outdoor curtains for the pergola, and—even without the add-on—it’s become a real destination. On a much smaller scale, Change Order No. 30 might have been the smartest $402.50 I ever spent. It went toward the repainting of our master bedroom. I’d been trying to approximate a pale green woven throughout one of our fabrics, but I missed the mark. “I can’t sleep in a room that makes me think of asparagus pee,” I told Kathy. With the blessing of my design consultant and close friend, Ethan Allen designer Sydney Sorenson, I switched to Sherwin Williams’ #6765: Spa, an intense aqua. The moment I saw it, déjà vu tickled my spine. A decade ago, I got the name from the owner of Grace and Shelly’s Cupcakes. I was living in a house with too many earth tones to make it work at the time, but that blue—and the cupcakes—stayed with me. “Will I go to bed every night thinking of buttercream frosting?” I asked Sydney. “We were a year ahead of our time,” she said. “Actually, Mom was,” I said. Three weeks before my mother passed away from ovarian cancer in May of 2016, I showed her five potential greens as a way of brightening her day. She chose Kiwi, and I’ll never repaint. My other major paint lesson came from Jaime Perez of Premier Home Finishes, who taught me not to paint a room a dark, Benjamin Moore color with a matte finish. For some reason, they don’t hold up very well. Who knew? Unfortunately, we painted our son’s room a dark blue, and three months after we moved in, it needs to be repainted. On the other hand, there’s no white as bright and uplifting as Benjamin Moore’s #OC-65: Chantilly Lace—the main color for our interior and exterior—and so far, it’s held up just fine. “In 20 years, I’ve only gotten to use colors like yours in two other houses,” Jaime said, shaking his head. He confirmed my suspicion that way too many people like beige. As you may have noticed, I have begun to care about color the way interior designers, artists and bumblebees care about color. This is a side effect of building a home from scratch. Selecting fabrics for all of our window treatments with Sydney allowed me to bask in the glory of color. We found some great ones in the dreamy new Kravet fabric showroom in Naples, most notably the white, pink and orange ikat pattern in my home office, and a lime and aqua bamboo trellis pattern for my master bedroom, Lilly Pulitzer’s linen “Well Connected” in Green/Aqua. “Well Connected” refuses to stack properly as an automated Roman shade because of its blackout liner. Fran Fechter of the Designers Wholesale Workroom has spent almost as much time trying to tame those three window shades as the gang from A-1 Sound & Security has taming our electronics. They should all be sainted. As I learn about home design, I evolve. Then I go rogue. I found the artwork, barstools, dining room table, pendant lights, coffee table, console, living room sofa and several rugs on my own. I didn’t understand the potential for a clashing, discombobulated disaster until it came time to find a china hutch capable of marrying Nantucket to Milan: the kitchen and dining room are 10 feet away from each other in a big, open space. “Can we go with black bamboo, and make it seem as if Meg Ryan and Armand Assante fell in love and honeymooned in Hong Kong?” I asked her. She blessed the black bamboo. “I’ve had some sleepless nights over your home, but it all came together in the end,” Sydney said. “I’ve always believed that if you buy what you love, it will all work out.” A lesser design professional would have been driven to drink. Everything I’ve described thus far pales next to the slings and arrows of preconstruction I detailed in last year’s article. Were all of our late-stage construction mishaps penny-ante stuff? I wish. We had a few significant problems. We counted ourselves lucky to be dealing with a reputable, caring builder when they emerged. The first significant hiccup involved our cork floors. They were installed while we were away for the summer. Upon our return, the color seemed off to me. I pulled the sample board out and saw that, while we had chosen a yellow-toned product, a reddish-brown one had been installed throughout 1,000 square feet of our upstairs living area. Apparently, natural variations in the same type of cork run the gamut from yellow to reddish brown. We decided we could live with it, and the owners of the Wood Floor Company, Tricia and George Pallak, gave us a generous discount for our flexibility. Cork is relatively cheap. Hardwood is not. When Tricia and George installed approximately 4,000 square feet of hardwood flooring throughout our main living area, I worried that I had made a poor choice. It was one of our major splurges: Flooring accounted for $84,428.61 of our total budget. So when I say “worried,” I mean “began to have heart palpitations.” In the store, I loved that it was a beautiful reclaimed wood that had already lived a rich life on a factory floor in Virginia. There would be no toxic “off-gassing” (as there is with new materials) that might harm our child. As a bonus, its beat-up appearance would make it kid-friendly. Gorgeous and smooth as it was as a sample board, our reclaimed floor turned out to be quite rough, uneven, and full of holes and shards, even after it had been sanded and varnished. That might work in a house where people wear shoes, but we’re strictly a barefoot-in-the-house family. “We’re not going to stop working on it until you’re happy,” he said. I like to think of Jim as my construction husband. Mark Smith, Tricia and George Pallak, Jim Nelson and I had a meeting to talk about what to do. I braced for battle. “Absolutely,” they assured us. “We’ll give it another go-round.” No battle necessary, which is great because I hate fighting. The reclaimed product we chose was new for the Wood Floor Company, and they were learning about it right along with us. Installing wood floors is a grueling endeavor, and I’d have been cursing a blue streak if someone asked me to redo 4,000 feet of it, but they couldn’t have been nicer. When I found out that George is a wounded veteran who was doing all of the finish work alone, my admiration grew exponentially. Happily, the second layer of varnish did the trick. Suddenly, the whole house looked like the sample board: a real showstopper. At the risk of tempting fate, I’ll say we’ve been barefoot in this home for three months and have yet to grapple with a single splinter. I wish the story of our outdoor flooring had the same type of happy ending. I fell in love with the weathered gray version of a new Trek-like composite product called Zuri at our landscape architect’s offices. I carried a sample for months in a tote filled with tiles, and it never scratched or looked any the worse for wear. That all changed when Lee Bassel of Bassel Builders began the installation. Lee did all the framing carpentry. He’s the sort of person who inspires confidence even when he’s telling you that excessive rain has caused your pool deck to sink 5 inches and need to be reinforced. Yet I could sense his frustration. “I’ve never seen another product shrink and expand this much in a 24-hour period,” he said. I noticed that the Zuri planks were getting white scratches in their acrylic coating and asked the crew to use tarps. When the plastic-backed tarps came up, we noticed widespread whitening on the gray deck that didn’t come off with cleaners. To make matters worse, I had been sold on a new-and-improved, cooler-to-the-touch composite. My first barefoot walk on a sunny Florida day told me I need to develop more skepticism in the presence of salesmen. We spent almost $53,000 on Zuri materials and installation for our front porch and pool lanai decking. Cue the anxiety attack. In November, the Zuri rep walked the deck with my construction husband, Jim, and me. “Don’t worry, we’ll take care of the damaged boards,” he said. Well, the holidays must have been extra good to this man because in January he had no memory of his promise. The company flew one man down from New Hampshire to address the issue, armed with only an electric handheld dryer, duct tape, Windex and a toothbrush. No replacement boards. The rep joined him. They came and went without solving the problem in several areas, blaming the builder. “Harwick will handle it, don’t worry,” Jim said. In the end, Harwick stepped in and made it right. They did so without an argument, for which we are truly grateful. We will enjoy our beautiful—if delicate—deck, and we will spray from a safe, grassy distance. If I hadn’t already repressed the details, I could tell the tale of The Revenge of the Mahogany Tree—how 15 minutes of chainsawing one half-dead tree on a windy/rainy day nearly destroyed our sparkly white pool, pool trellis and furniture. Building this house, or perhaps any house, has been like getting degrees in design and construction. I learned that you should never install grass where the sun doesn’t shine (artificial turf to replace the dead northern lawn: $5,000). Make sure to ask for light dimmers early, not late in the process ($3,659.30). Ask your builder to install a separate irrigation meter unless a monthly $1,600 water bill seems normal to you. When you choose polished nickel faucets, understand that no bleach or ammonia cleaning products can come within a 5-mile radius of any sink or tub in your home. And don’t buy any appliance that’s smarter than you unless you want your 7-year-old to catch you cursing at the microwave. There are too many lessons to cite them all, or maybe there’s really just one: Make sure you’re working with patient, ethical builders. We made genuine friends during this process, and we intend to keep them for many years to come. After all that work, it’s time to put up our feet, sip our chai and enjoy the view.